🐒 AVERAGE $$ VOLUME TRADED HIGHER over the last 24 hr period as of this writing at 7:00 AM EST. 🐒 I have put together a chart of the top 40 Cryptocurrencies listed on coinmarketcap starting on September 16 , 2018. 🐒 The Average 24hr dollar volume of the top 40 Cryptocurrencies has created a trading zone between $198,268,498 and $572,000,376 and today is trading above that zone at $586,836,206 . The Average 24hr dollar volume of the top 40 Cryptocurrencies has broken above the consolidation zone . 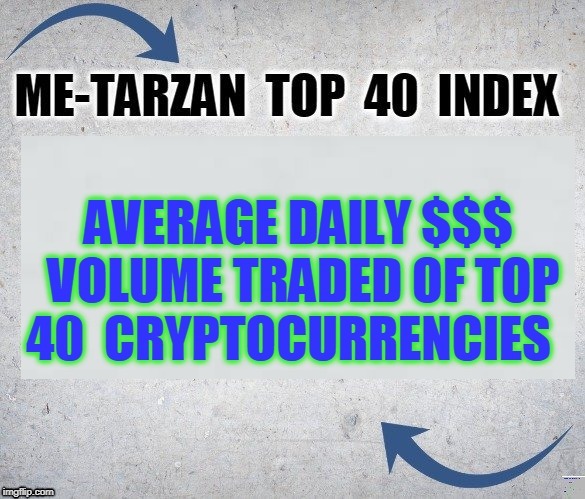 In order for the crypto market to have a bull market this Average 24hr dollar volume of the top 40 Cryptocurrencies should trend higher on days the price increases , by trending higher above the zone on days the price increases it would show renewed interest in the Crypto markets ( IMHO ) .